Sweet, dry, rich or creamy, the flavors of sparkling wine are as complex as its history and creation. The proverbial “pop” of the cork instantly conveys celebration; the clink of two crystal flutes declares a special moment. Champagne is the beverage associated with festivities and the finer aspects of life. However its origin, and the path it traveled to become the drink we toast with today, is fraught with as much complexity as the sparkling wine itself. The cold weather would cause the fermentation process to temporarily halt, leaving some residual sugars and dormant yeast in the barrel. The temperatures rose after the wine had been transferred to glass containers, then fermentation restarted and led to a buildup of carbon dioxide. Trapped in the bottle, the gas created carbonation—and unwanted explosions. Dom Pérignon, who is often cited as the inventor of Champagne, was a monk who actually devoted his time to trying to rid his abbey’s wine of the dreaded bubbles caused by this second fermentation. But when he wasn’t able to combat them, he embraced them. After taking his first sip of the sparkling wine, legend has it that he exclaimed, “Come quickly, I am drinking the stars!” Whether he invented it or not, there is no debate that Pérignon developed many of the techniques that are still crucial to making Champagne today, such as the process of making white wine from red grapes. Meanwhile, the bubbly beverage was catching on with English nobility. In fact, it was English physician Christopher Merret who created a stronger glass to prevent the bottles from bursting. The invention eventually transferred to France, where the world’s first Champagne house—Ruinart—opened in 1729. Today, sparkling wines are made the world over, but only those from Champagne, France can be labeled “Champagne.” The first French appellation laws were passed in 1936. These set the specific regulations for the growing region, grapes used, viticulture practices, aging requirements and more. For example, seven grape varieties are approved for use in Champagne. A process called assemblage is one of the most critical steps in production, where grapes from various vineyards and harvests—often pinot noir, pinot meunier and chardonnay—are carefully blended prior to the second fermentation, which the Champagne method dictates must occur in the same bottle from which the beverage will be served. Strict production rules require non-vintage Champagnes to be aged “on the lees” for at least 15 months. This means that the Champagne is stored in the bottle and is gradually turned and inverted until the sediment (lees) is removed. Vintage Champagne must be aged in cellars for three years or more. Champagne appellation rules such as these, which are constantly revised and updated, set the basis for the winemaking framework adopted throughout France—where sparkling wines made in the Champagne fashion outside of that region are generally known as crémant—and other European countries. Spain’s sparkling wine is cava. It is produced via the traditional Champagne method but using a blend of native Spanish grapes: macabeo, parellada and xarel-lo. Less complex than Champagne, cava tends to be drier than Italy’s sparkling wine, prosecco. For prosecco, the Charmat (or tank) method is applied to glera grapes. This process allows fermentation to occur in large steel tanks rather than in the individual bottles—a less complicated approach that results in a softer wine intended to be consumed young. Also from Italy is Moscato d’Asti, a semi-sweet, low-alcohol wine from the Piedmont region, and Franciacorta, one of the country’s finest sparkling wines. 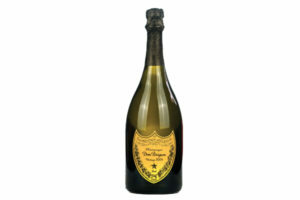 High quality Californian producers offer American versions of the big Champagne house offerings. 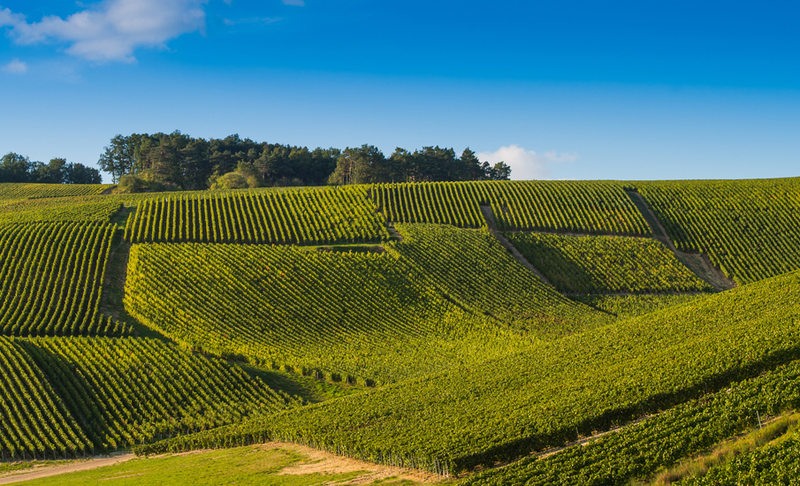 France’s Champagne Louis Roederer, for example, owns Roederer Estate in California’s Anderson Valley. In France, the tête de cuvée is Cristal; in America it’s L’Ermitage. Iron Horse Vineyards, from the Russian River Valley, produces Sea Island’s own house sparkling wine, the latest vintage of which the sommelier and production team took great pains to perfect. “Champagne is a beautiful thing; it’s bubbles in a glass,” says Christopher Lodge, sommelier of Sea Island’s Forbes Five-Star Georgian Room. “It’s a big part of our wine list.” The Georgian Room pours two Champagnes and one Franciacorta by the glass, as well as five Champagnes and two Italian sparkling wines in half bottles. The wine list offers numerous varieties of Champagne. Lodge’s personal preference is the rich and creamy Bollinger Grande Année Champagne. “It’s mostly pinot noir and is aged in French oak barrels which gives it a texture, a creaminess, from being in an oxidative state in the barrel,” he explains. “Other houses, such as Krug, will age in new oak barrels and the taste has more of a vanilla flavor. Hold a glass of Bollinger up to a glass of Ruinart and you’ll see a darker color, more nutty.” For those who prefer crisp and refreshing, Lodge says that the most popular style is a blanc de blancs Champagne, which is made from chardonnay grapes. Champagne (in addition to some sparkling wine) designations are characterized by the type of grapes used or the amount of sugar added. These include blanc de blancs (white grapes), blanc de noirs (dark grapes), brut (dry, little sugar), extra dry (small amount of sugar), demi-sec (sweet, but not sappy) and rosé (some red wine blended in). The best way to learn about Champagne and to determine your particular taste preferences is through experience. Tonight, we invite you to raise a glass of the bubbly before, with or after dinner—or perhaps even sample a different variety at each stage of the meal. You never know when you might have your own life-changing sip. 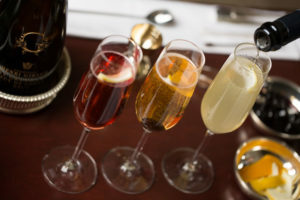 Sea Island’s mixologists combine sparkling wine with other ingredients for creative cocktails. BELLINI: As per Harry’s Bar in Venice, Italy, the Bellini mixes prosecco with peach purée. Sea Island Sommelier Christopher Lodge offers sparkling wine guidance for the budding oenophile. 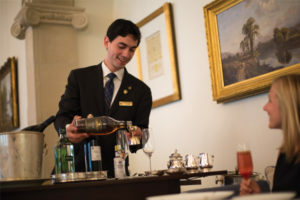 Sea Island sommelier Christopher Lodge mixes Champagne cocktails. Lodge says the classic Champagne flute is a the preferred option. Because it is long and narrow, bubbles have a very small bottom to launch from, so it takes much longer to lose them. Another great choice is a white wine glass. “Aroma can collect in the bowl and the bubbles have longevity,” he says.